At Corigin Ventures my mandate is to build and execute a platform strategy that will support our investment process and the portfolio of companies we invest in. I find the blank slate to be both exhilarating and daunting because it taps into my creative abilities, but also begs the question of “which direction do I head in?” After many discussions with other people in similar platform roles, I know that this dual perspective is universal and I’m now part of a community that’s collaborating to define “platform”. The only thing I was certain of when I began was that I needed to listen really well. I am an avid, although average, student of the art of listening, and I believe great listening leads to better conversations, relationships, organizations, and societies. However, I also know firsthand that “most people do not listen with the intent to understand; they listen with the intent to reply,” (Stephen R. Covey). This is an all-too-common, yet critical mistake that I’ve made many times, especially when trying to help someone else. As I stepped into this role that revolves around assisting and supporting others, I was reminded of one of my all-time favorite TED Talks: Ernesto Sirolli’s Want to Help Someone? Shut Up and Listen! I took his message to heart and got to work knowing that it would take time, patience, and intention to develop our platform strategy. I spent the first three months of this journey exploring, listening, and learning from many founders, the team I work with, partners in our networks, and other people in similar platform roles. My goal was to understand the types of support early-stage founders need most, my team’s strengths, how people interact within NYC’s startup ecosystem, and the offerings that were already proving successful at other Seed-stage VC firms. · Early-stage founders most often want help with fundraising, introductions to networks of potential customers and subject matter experts, and building teams. This seems to be the case across the board from everyone I spoke with and many resources I was reading. · Founders live in a place of lack: lack of time, capital, engineering talent, etc. Anything investors can do to close those gaps and let the innovators get back to innovating goes a long way, and so does shifting the founder mindset away from a constant state of anxiety. In the midst of all my listening, I became inundated with all the endless options our platform could provide, and I forgot to listen to another important voice: my own. Thankfully through a platform conversation with Meltem Demirors, Director of Development at Digital Currency Group and a fellow MIT Sloan alumna, came one of my favorite pieces of advice: to create our competitive advantage, I needed to find the intersection of what Corigin Ventures could offer and what I was most passionate about. This was so refreshing to hear because our success as a Seed-stage firm lies in our ability to focus on doing a few things really well. I took Meltem’s advice and dug in to my own perspective. My background lies in finance, but my passion lies at the intersection of technology, operations, and human capital. I enjoy working on disciplines such as: operations management, organizational design, and leadership and personal development. I wanted to create something that was operationally efficient and scalable while not losing the sincerity, care, and authenticity that my team had already proven time and again. Taking my notes and the trends I was seeing, I created a list of themes that had emerged about our identity as a Seed-stage venture capital firm, the values we operate by, the most common founder requests, and my own interest areas. I spent an afternoon whiteboarding all this and laid out the first draft of our “why,” “how,” and “what” in that order. My mission in this exercise was to be laser focused on a few big offerings we can deliver exceptionally on while leaving enough flexibility for inbound requests outside the main scope. I gut checked each step along the way to make sure that everything built on top of the “why” would help us accomplish the goals we set and actually tied back to the purpose of our platform. Why: We believe the Seed stage is the most formative time within a company’s life cycle: teams, norms, culture, and path forward all get set during this period. As dedicated Seed stage investors, we leverage our knowledge and resources to impact a founder’s journey by helping build strong company foundations. How: At the core of all of this is the truth that people matter most to us and they will always be at the center of everything we do. With that in mind, we use founder feedback to drive direction, we productize key initiatives to allow for scale, we measure everything we want to manage, and we share our insights with the community. What: The Corigin Ventures Playbook of platform offerings will focus heavily on organizational design and talent curation, fundraising strategy and assistance, and founder wellness and development (my personal favorite). This is supported by a strong network and incredible fund advisors, operational resources, and other offerings driven by inbound founder requests. I wanted to get to this stage of development much faster than I did, but the truth is this is the most critical step in the whole process of building a platform (or anything!). If I didn’t get this right, I would be spending the next few years building something that most likely falls flat and doesn’t make a measurable impact or achieve any goals. Patience is a hard thing to practice, but I am setting up our firm for success by taking the time to use this process to its fullest potential. 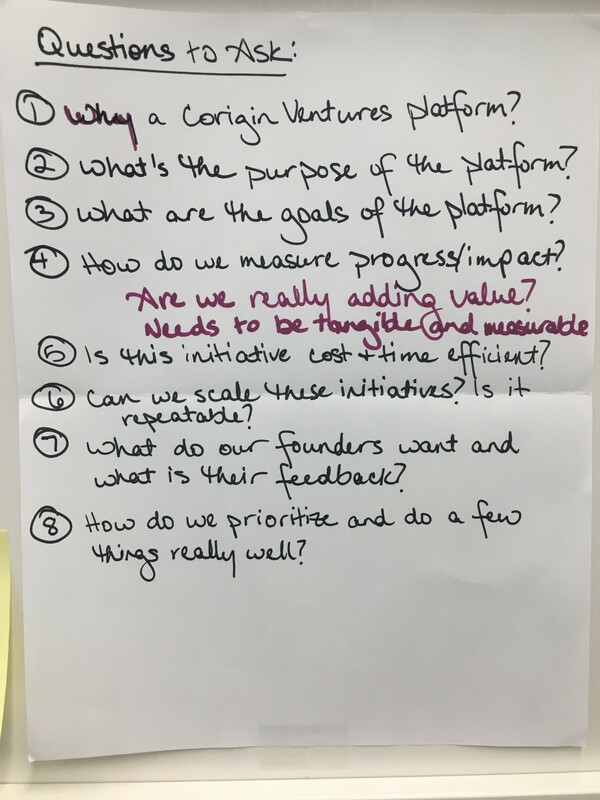 After refining our purpose and agreeing to focus on a few areas where we can make the biggest impact on a founder’s journey, I began working with one of our advisors on how we tell the story of the Corigin Ventures platform and its offerings. As this is taking shape, I will spend the next six to nine months building out each of the components of our platform strategy and executing on these offerings. Stay tuned as I share my journey and the details of our platform along the way.